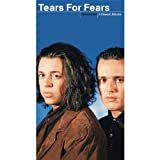 Tears For Fears', "Closest Thing To Heaven"
Tears For Fears', "Laid So Low (Tears Roll Down)"
What makes this song particularly upbeat but depressing is that he sings about laying so low that tears roll down with peppy music. Tears For Fears', "Mad World"
And I find it kind of funny. The song is very up tempo and you can dance to it, but you might not feel like it after hearing he likes the thought of dying. Tears For Fears', "Mothers Talk"
We can; we can work it out. According to Roland Orzabal there are two things that Mothers Talk is about. The first of which is an old wives tale about mothers telling their children when they make a face they say "your face will stay like that when the weather changes." Hence the line "My features form with a change in the weather." The line " when the weather burns then you know you're in trouble." comes from the governmental powers in the U.S. and U.K. at the time starting a potential third world war which scared Roland a little bit. Tears For Fears', "The Prisoner"
Tears For Fears', "The Way You Are"
It has a lively beat to it but I don't know of anybody who wants to be told that they're not going to go far by not being the way that they are.